I’m surprised that I’ve never written about this video before, but it’s always better late than never. Meet Robert Lustig, MD. He’s kind of a big deal. Dr. Lustig is a childhood obesity expert… and recently, the NY Times posted a write-up about his presentation – a lecture given a few years back that has garnered almost a million views – to further detail what makes his argument so compelling. Now, I’ve seen the video several times – believe it or not, I actually have it on DVD and watch it regularly to remind myself – so I’m very familiar with what he’s talking about, here. Of particular interest to me – and should be of extreme interest to those of us with type 2 diabetes – is where, at a little past an hour in, Dr. Lustig talks about the reversal of type 2 diabetes. Not living with diabetes, but reversing the condition. Who, out there, has a doctor who explained that process to them? Earlier this month, Gary Taubes – writer of “What If It’s All A Big Fat Lie?” as well as the book Good Calories, Bad Calories: Fats, Carbs, and the Controversial Science of Diet and Health – penned the aforementioned article, which doesn’t surprise me in the least. Taubes is a relatively predictible source of anti-carbohydrate lifestyling and has, if I’m not mistaken, written a book titled Why We Get Fat: And What to Do About It as well as proclaimed his alliance with Team Atkins. I’m simply not surprised to see his name in the byline. That being said, the question that Taubes’ article asks in the title – is sugar toxic? – is one that I can easily respond to with a resounding YES. Before I get to that, there are a few parts of Taubes’ article that I’d like to highlight, for those of you who’ll see the fact that Taubes’ article is 9-some-odd pages long and decide to turn away from it… like I almost did. Please keep this in mind the next time you watch TV and see a stupid soft drink or juice commercial saying “We use real sugar!” in it. It’s a brand-new day when table sugar is lauded as a “healthy alternative.” Seriously. The conventional wisdom has long been that the worst that can be said about sugars of any kind is that they cause tooth decay and represent “empty calories” that we eat in excess because they taste so good.By this logic, sugar-sweetened beverages (or H.F.C.S.-sweetened beverages, as the Sugar Association prefers they are called) are bad for us not because there’s anything particularly toxic about the sugar they contain but just because people consume too many of them. The highlighted part of this is another reason why it makes very little sense to ditch all fruit in an effort to ditch sugar. Aside from the fact that fruit is a source of nutrition, there’s also the fact that in a lot of fruits, the amount of sugar is nowhere near as much as what’s found in modern sources of sugar. This makes me think of the article I brought up last week, about egyptian mummies having clogged arteries. Perhaps… never mind. Let me see if I can put this in a different perspective. 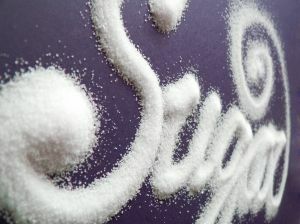 A teaspoon of sugar is 15 calories. That means you’d be somewhere around 13 teaspoons of sugar in a day in order to make sure you didn’t go over the 200 calories per day limit (15 calories x 13 tablespoons = 195 calories.) There are 210 calories of sugar in a simple 20oz of pepsi. Couple that with the amount of sugar hidden – or not so hidden – in our processed foods, salad dressing, condiments and fruits (canned fruit, anyone? ), you’re quite possibly overdoing it on the sugar. Rather the context of the science changed: physicians and medical authorities came to accept the idea that a condition known as metabolic syndrome is a major, if not the major, risk factor for heart disease and diabetes. The Centers for Disease Control and Prevention now estimate that some 75 million Americans have metabolic syndrome. For those who have heart attacks, metabolic syndrome will very likely be the reason.The first symptom doctors are told to look for in diagnosing metabolic syndrome is an expanding waistline. This means that if you’re overweight, there’s a good chance you have metabolic syndrome, and this is why you’re more likely to have a heart attack or become diabetic (or both) than someone who’s not. Although lean individuals, too, can have metabolic syndrome, and they are at greater risk of heart disease and diabetes than lean individuals without it. Just as an extremely superficial side note, this further highlights the fact that cutting the sugar causes your waistline to shrink. This goes back to Lustig’s point, about an hour and 10 minutes into the lecture, about reversal of type 2 diabetes. Diabetics, have your doctors discussed this with you? No? Oh, okay. My totally non-scientific opinion on this topic here? Look at the vessels through which a lot of sugars – the item that causes insulin resistance – are served… and that’s chemical-laden processed foods. thank you for this amazing inforamtion. Do you know where I may purchase the DVD of Robert Lustig, MD. “The Bitter Truth about Sugar”? Wow, this was a great article. It made me rethink alot of things when it comes to weight loss. “A calorie is not a calorie”…hmmm…At one point I was inclined to think that sugar was akin to drugs like crack and cocaine, but then put it in the back of my mind. This is really something to think about. The part in the video where he talks about how the consumption of fructose has the same affect as ethanol was surprising to me..the same toxic effect? WOW! He also pointed out that when fructose is consumed, the brain does not recieve the signal that your hunger is satisfied, and thus you continue to eat. In my ongoing battle with food, I thought that the reason I overeat certain things (Oreo’s and Subway’s choc chip cookies to be more specific) is simply because the food tastes good…and what makes the food taste good? lol, again GREAT ARTICLE, VERY INFORMATIVE! I am showing this to my father. Hopefully, the more I try to educate him, the more I can help his and my mother’s health. I mean, they’re Haitian. They know and have preached about natural food. I think my pleading for food from the American diet as a kid has changed that. Now I just need to change it back for all of us. Thank you so much for your wonderful blog. This article was such an eye opener – and further clarified and solidified the reasons why I was already making changes. Thank you for the video as well it was so well worth taking the time to watch. Keep up the great job of educating and helping others learn to make better, more educated decisions about being healthier. My biology teacher, a scientist I only learned to respect completely after I finished secondary school has long blamed sugar for high levels of bad cholesterol. I am learning to give it up. Also recently learnt that flour is bleached with CHLORINE. And apparently the chlorine once ingested first attacks your pancreas! The pancreas produces insulin. Connect the dots! Amazing article and as relevant today as it was then. I still identify this prevalent belief from Americans writ large, particularly within the AA women that sugar is just the white granulated stuff that comes in the yellow box. As long as they do not have the white powder, fruit, fruit juices, fruit smoothies, sugary tuberose, white flour and rice; and sugar substitutes get a pass as not being sugar. I identify this belief on pretty much every comment here… Dr. Michael R. Eades. has an amazing blog that breaks ‘sugarisms’ down. Congrats!